University of Oklahoma professors, Helen Zgurskaya and Valentin Rybenkov, and team are addressing the challenge and critical need for new antibiotics that can fight infections caused by the multi-drug resistant bacterium, Pseudomonas aeruginosa, considered an urgent threat by the Centers for Disease Control and Prevention. The OU team responded to a special request for applications from the National Institute of Allergy and Infectious Diseases, National Institutes of Health, and received a five-year, $5.7 million grant to develop new, more effective approaches against Gram-negative bacteria that are protected by multi-drug efflux pumps and low-permeability membranes. 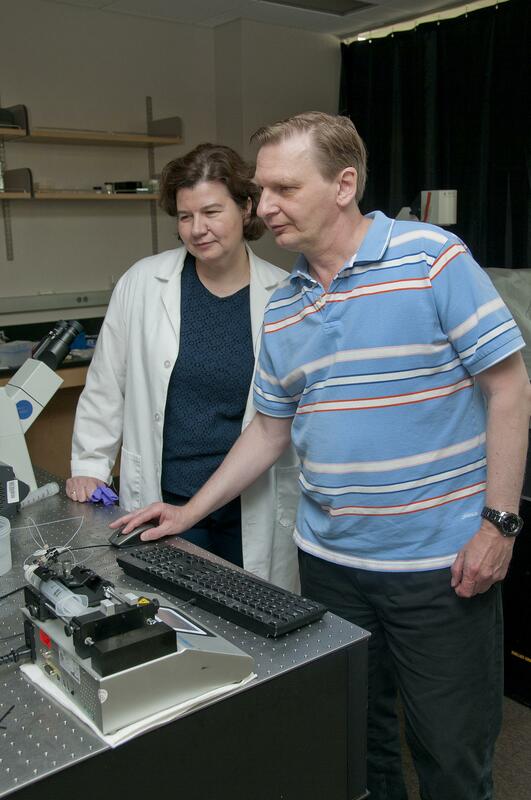 "OU Professors Zgurskaya and Rybenkov are recognized leaders in developing effective ways to combat bacterial strains that resist conventional treatment," said Kelvin Droegemeier, vice president for research. "Such strains are becoming more common, and because the infections they cause can lead to sepsis and death, finding aggressive therapies is an urgent national priority. We are very proud of the international team OU is leading to tackle this important challenge." "The challenge is to develop approaches that will enable antibiotic penetration across non-specific permeability barriers of Gram-negative bacteria, which poses an urgent and serious threat to public health," said Zgurskaya, a professor in the Department of Chemistry and Biochemistry, OU College of Arts and Sciences. "In response, we are developing a new technology for optimization of efflux avoidance and inhibition in clinical and investigational antibacterial agents that will be effective against Gram-negative bacteria." Zgurskaya, the expert in bacterial efflux pumps and antibiotic resistance, and Rybenkov, the expert in kinetic modeling, are working with Paola Ruggerone, University of Cagliari, Italy (computational modeling of drug efflux); Gnana Gnanakaran, Los Alamos National Laboratory (computational modeling of transmembrane diffusion); John Walker, Saint Louis University School of Medicine (synthetic chemistry); and Basilea Pharmaceutica, Switzerland and The Medicines Company, San Diego, California (efflux pump inhibitors). "We have to understand the difference between the antibiotic and the efflux pump inhibitor, so we can combine the properties of both to get compounds inside the cell and kill the bacteria," said Zgurskaya. "OU will do the experimental and kinetic analysis of the data; the University of Cagliari will compute efflux pump interactions with antibiotics and inhibitors; Los Alamos National Laboratory will determine how inhibitors and substrates permeate the membrane; and Saint Louis School of Medicine will synthesize new molecules with the new properties. Basilea Pharmaceutical and The Medicines Company can then test this new approach in development of efflux pump inhibitors." Funding for this research is supported by the National Institute of Allergy and Infectious Diseases of the National Institutes of Health under Award Number R01AI136799. The OU-led project, "Optimization of efflux avoidance and inhibition for antibiotic development," is one of only four projects that received an NIH award for the development of new approaches to antibiotic-resistant bacteria. Harvard, Yale and the University of Illinois at Urbana-Champagne received the remaining three grants.